A.D.A.M. Interactive Anatomy 4 (AIA4) is an exciting interactive learning and teaching DVD-ROM that dramatically enhances the study of human anatomy and related topics. This "flagship" product provides many new enhancements, derived from extensive input from educators, authors, health professionals and students worldwide. The result is a new product that serves as a platform to bring high-quality content in anatomy and physiology for educators and students in medicine, allied health, and health sciences; Patient education; Healthcare providers; Medical publishers and Legal professionals. A.D.A.M. Interactive Anatomy 4 is a comprehensive database of detailed anatomical images that allows users to point, click and identify more than 20,000 anatomical structures within fully dissectible male and female bodies in anterior, lateral, medial and posterior views. The user is able to dissect the body layer by layer or use a scroll bar to navigate deeper. This unique "dissection" application offers an interactive approach to discovering the human body. This award winning product enhances the learning, teaching and sharing of anatomical information. A.D.A.M. 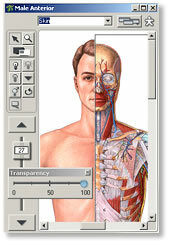 Interactive Anatomy 4, which has been extensively reviewed by panels of leading anatomists, is recognized as the standard anatomical database in computer-based medical education worldwide. Rather than only read about health-related subjects, users are empowered to view the particular body parts at issue, turning the study of anatomy into an interactive and engaging experience. AIA 4 includes many new enhancements, derived from extensive input from educators, authors, health professionals and students worldwide. The result is a new product that serves as a platform to bring high-quality content in anatomy and physiology for instructors and students in medicine, allied health, and health sciences; patient education; healthcare providers; medical publishers and legal professionals. These enhancements in the areas of performance, content, and features, make A.D.A.M. Interactive Anatomy a "must have" for learning anatomy.